PRS Guitars’ are happy to announce the official launch of the SE Santana. Carlos Santana’s new signature model is the very first SE offered with a 24.5” scale length and is also the first SE created using the same silhouette as Carlos’s revered American-made model. Look for the model on retail shelves this fall and on tour with Carlos as he tours the US in support of his new album Guitar Heaven: The Greatest Guitar Classics of All Time. Carlos’s influence as a PRS guitar player led to the development of the SE electric guitar series ten years ago, and he continues to play an integral role as an adviser, player, and endorser for one of the world’s most well-respected guitar brands. In honor this legacy, PRS Guitars welcomes players of all backgrounds and skill levels to visit a dealer this fall to try this guitar in person. The PRS SE Santana is an extremely versatile product line, and the value and quality continue to receive the industry’s praises year after year. “It is very important for PRS Guitars and Carlos to offer this high quality Santana model in a financially accessible price point. This SE Santana offers musicians an instrument well in excess of its price tag,” commented Paul Reed Smith. The Paul Reed Smith SE Santana features include a carved maple top, flamed maple top veneer, mahogany back, 22-fret one-piece “wide-fat” mahogany neck, rosewood fretboard with white perloid, old style PRS bird inlays. Electonics include treble and bass humbucking pickups, master volume and tone, three-way toggle switch, PRS tuners, and PRS tremolo. Check here for the hottest prices on Paul Reed Smith guitars. 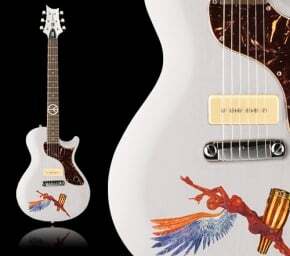 i would like to ask if i can purchase the santana se prs throught you website. My country is Greece. do you ship in Greece? am i getting charged any transportation cost et all? does the guitar comes using UPS or FEDEX directly in my home adress? Hi, good choice on a great guitar. That said, we’re not a guitar dealer, we are a guitar review and news blog. I would suggest check the resource links below the article and compare prices. Good luck!